I wasn’t terribly surprised to read the Associated Press story this week about the biblical inscriptions that appear on certain American military weapons issued to soldiers in Iraq and Afghanistan. Dismayed, yes. (Wasn’t the American government trying to distance itself from the notion that it was engaged in a modern Christian Crusade against the Infidels? ) But shocked, certainly not. As archaeologists and historians can attest, such inscriptions are part of a very old tradition, one that goes back many hundreds of years in cultures across Eurasia. For those of you who missed it, here’s the much boiled down version of the AP story. For the past 30 years, a Michigan-based military contractor known as Trijicon Inc. has put scriptural citations in raised letters on the sides of its products, which include combat rifle-sights. According to the AP article, U.S special operations forces in the Middle East currently carry Trijicon’s Advanced Combat Optical Gunsight into battle: it bears the inscription JN8:12, a clear reference to the Gospel of St. John, Chapter 8, verse 12, which reads: “When Jesus spoke to the people, he said, “I am the light of the world. Whoever follows me will never walk in darkness, but will have the light of life.” The folks at Trijicon clearly think that this verse will go a long way in assisting American soldiers in their hour of need. But the idea of inscribing a weapon with a sacred text to protect its owner is a very ancient one. Indeed it dates back at least 2000 years, to a time when metalsmiths closely guarded the secrets of forging iron weapons, creating an air of mystery and magic around them. 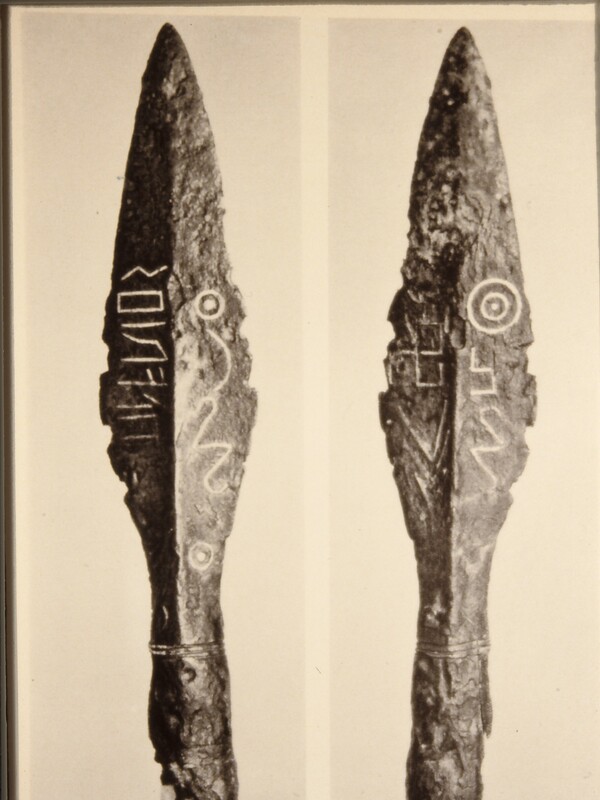 The inscriptions these ancient smiths forged on sword blades or along spear tips seemed to further enhance this power. History is replete with wonderful examples. Early Islamic warriors, for example, carried Damascus-steel swords inscribed with verses from the Qur’an. Lord Egerton’s classic book, Indian and Oriental Arms and Armour, describes one sword that possessed several inscriptions from the Qur’an–some for good times (“In everything there is speedy victory from God”), others for more perilous encounters ( “God is the best of Protectors.”). But the Moslem warriors were not alone. Japanese samurai also brandished swords inscribed with inspiring phrases–in their cases, from Buddhist or Shinto texts. If Trijicon had to inscribe some kind of message on its rifle sights, why couldn’t it have chosen something simple and to the point like that, instead of dragging biblical texts into Middle Eastern wars that are already plagued by fundamentalism.